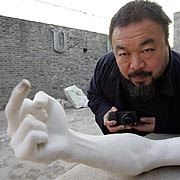 American director Alison Klayman followed artist Ai Weiwei in Beijing for three years documenting the artist as he and his volunteers seek to uncover the death toll of students who were lost during the devastating Sichuan earthquake of 2008. Ai investigated the “tofu” construction of the shoddily built schools that collapsed killing thousands of students. The Chinese government's attempts to keep this information under wraps leads to intimidation of Ai and his volunteers as they collect their information. What made this so different from other artists and writers who have criticized the Chinese authority was Ai Weiwei's ability to utilize the Internet's social media portals in communicating his political activism. Ai was one year old when his father Chinese poet Ai Qing was sent to a labor camp for re-education in 1958 where they lived for 16 years. Ai was one of the founders of the early avant garde art group in Beijing. He lived in New York City's lower east side from 1981 – 1993 creating conceptual art. He returned to China when his father is sick and found there wasn't any art activity in his community. He started a basically underground art movement creating books of art and selling them secretly out side galleries. He started blogging in 2005 where he would post his very vocal opinions and show his home made documentaries. His art work was been exhibited all over the world. In 2008 he designed the famous Bird's Nest stadium for the Beijing Olympics only to boycott the event itself as propaganda. In this film we are given a tour of his studio and his work made from his ideas by his assistants. For a show in Munich he covered a wall in colored backpacks that spelled out a remembrance from a mother who lost her daughter during the earthquake. “She lived happily for seven years”. At the Tate Modern he fills a large gallery floor with 100 million hand painted porcelain sunflower seeds for museum goers to walk on and think about the power of anonymous millions. His most emotional piece was the wall of the names of the over 5000 children lost during the earthquake that his volunteers investigated along with their ages and grades. Chinese authorities had shut down his blog and put surveillance cameras around his studio. Ai in turn takes pictures of the cameras and posts them on his twitter feed. The documentary also follows the event where Ai was beaten by the police and he suffered a brain bleed from it. They follow him while he makes attempts to complain about the treatment and tries to bring a lawsuit. The government decides to destroy his studios. So Ai Weiwei invites his supports via Twitter for a demolition party. In April 2011 he was arrested and detained for 81 days. The news went viral with various countries demanding his release. When they let him out he was handed a $2.4 million tax bill and forbidden to talk about what happened or leave the country. Ai Weiwei is a burly man, a sharp insightful mind, deadpan eyes and a political activist artist who found a way to shine the light on his country and make their actions transparent. The documentary presents Ai's charisma and sense of humor like why can't cats open doors? And then one of his 40 cats opens the doors, he wonders why they can't close them. But you know he's pondering bigger questions. Like us all we should also ask ourselves what are we doing to become more aware who we are and where we are going. This is a engaging and important film.